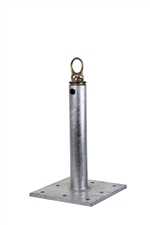 The Guardian Fall Protection CB Anchor Series are perhaps the most proven fall protection anchors on the market. Intended for permanent applications, CB Anchors are compatible for installation onto wood, steel, and concrete substrates (fasteners are included for wood and steel applications). Cable Grab - 3/8" Heavy Duty Edge Series Self Retracting Lifeline D Bolt Anchor Web Retractable Lanyard - 11 ft.